Old-school cool with a Bluetooth edge. Every new wireless speaker we receive feels like it’s more complicated than the last. Anybody who wants to give their life over to Alexa or Siri is more than catered for, but those who just want a simple Bluetooth audio experience often end up paying for things that they don’t necessarily want to use. Kanto’s SYD speaker is proof that this doesn’t have to be the case. In this review, we break down the SYD’s sound, design, packaging and accessories, specs and more. To see how it stacks up, see our list of the best wireless and Bluetooth speakers. The $330 Kanto SYD gave us exactly what we expected: highly refined, competent sound that really managed to hold its own when compared to other speakers in its price range. The overall impression was of a tight, compact soundscape that never overcooked things, and which we felt we could listen to for hours at a time without being fatigued. This was particularly evident in the low-end. The bass that the two 4” kevlar drivers pumped out felt crisp and controlled, with a good level of detail. It never felt overwhelming, never pushed itself into the mix with more force than was absolutely necessary. It certainly wasn’t going to shake the windows – the speaker outputs 70 watts of RMS power, and 140 at its peak – but the volume was definitely there if we needed it, and distortion at high power was relatively controlled. The speaker’s low-end certainly beats the pants off similar, cheaper speakers, like the SOLIS SO-7000 (full review here), which got a bit boomy in the low-mids. That speaker costs $250, and we much prefer the SYD, which you can also EQ to get the sound you want. On some songs, we found that the high-end was just a little bit recessed, it was a very minor issue. For the most part, the audio at the top was highly detailed, with a nice level of snap. This was one of those speakers that got intensive testing over many, many hours – we try to test all equipment this way, if possible, but inevitably some pieces of gear end up getting trotted out more often than others. Because of the SYD’s ease-of-use (which we will go into more detail below), we ended up using it a lot while working, and the one thing became clear quickly was that it was very easy to listen to for long periods of time. The lack of harshness on the top end definitely contributes to this - although we do think speakers like the SONOS PLAY:3 (full review here) handle the highs just a little bit better, and at a cheaper price ($250 versus $330 for the SYD). Again, we aren’t talking about world-beating sound here, but we certainly didn’t have a problem with the audio picture being presented. One area, where the speaker has others unquestionably beaten, is in the stereo spread. Because it has two full-range 4” drivers and two 1” tweeters, it gives a much wider soundstage than something like the Bose Soundlink Revolve+. That speaker is only slightly cheaper than the SYD, at $299, and we know which one we’d pick. We really came to understand this when we looked at our listening setup; the office we write in is a little way off our main listening room, forcing the SYD to work quite hard in order to convince us of its stereo field. It did this without even breaking a sweat, presenting a gloriously-wide image with a huge sweet spot. This makes it the ideal speaker if you have slightly tricky surroundings to fill with noise. One criticism: the volume changes felt a little bit imprecise. Even when adjusting in slight increments using the built-in volume knob, we felt like the SYD was sucking up big gulps of volume. As a result, it was often hard to get the level we wanted, and we had to spend a little more time fiddling than we thought strictly necessary. It’s something that we hope the company will rectify in a future update. It’s worth talking, very briefly, about the connections that the speaker uses. In particular, it’s worth talking about the aptX Bluetooth. You can read more about this type of Bluetooth here. It’s the current gold standard for the transmission of Bluetooth audio, and in the case of the SYD, it works flawlessly. We never had a dropout, never had a glitch, never had any issue with pairing multiple devices. The SYD performed flawlessly. We did find that we missed the Wi-Fi connection offered by the aforementioned SONOS speaker, and we do get that that can totally be a problem for some people. But it wasn’t too much of a problem for us. No one is ever going to enter the SYD in RuPaul’s Drag Race. It’s a big, rectangular box. It has speaker drivers on the front, bass ports on the back, and a couple of controls. It is as unassuming and respectful as an accountant in a reference library. But, simply because someone is an accountant doesn’t mean they can’t wear a nicely-cut suit. And, upon closer inspection, it’s clear that the suit the Kanto is wearing is very well-cut indeed. It certainly doesn’t have a styling of something like the B&O Beoplay A6… But that speaker also costs over double the price of the SYD. For what you pay, the Kanto model acquits itself well. Perhaps, it’s because there are so few angles. The rounded top corners echo the curves of the speaker drivers; those in turn are echoed by the circular volume knob and remote receiver window (which houses a frankly evil-looking yellow light). It might be a big block, but it feels unthreatening, and slotted well into its surroundings. It also helped that its surface picked up neither dust nor fingerprints – a real achievement, given that ours came in black. The matte surface is a joy, and if you don’t like the colour scheme displayed on our photos, there are plenty of other colors available (including pink). And now we get to the nub, the reason why we really enjoyed the speaker so much. We’ve touched on it already: the fact that every wireless speaker these days has an artificial intelligence inserted in it, which will inevitably make your life more complicated than it needs to be. We get plenty of these speakers traipsing through our offices. So, it was strangely refreshing to get one as resolutely old-school as the SYD. The remote control deserves a section of its own – it’s that good – but what we will say here is that setup of the SYD was absolutely effortless. Unpacking it, plugging it in, and listening to music took less than two minutes, with nary an app in site. Establishing a Bluetooth connection was very simple. A chimp could use this speaker – and at a time when that’s not always a given, it’s a big plus. If you do want a speaker that incorporates a robot assistant, and matches it with (mostly) good sound, try the SONOS ONE. We prefer the SYD, for other reasons, but as smart speakers go, it works reasonably well. It’s also cheaper than the SYD, at $199 to the latter’s $330. This could have operated as a simple Bluetooth speaker, and it would have still received the thumbs up from us. Which made it a pleasant surprise to actually get many inputs and outputs here, and be able to connect so many different things. Unlike many wireless speakers, you get a ground input for your turntable, meaning you can integrate this directly into a vinyl setup. There’s an additional phono stage, a line in, and even an optical connection. That’s a lot more than many competing speakers offer – even the SONOS PLAY:3 doesn’t have that much. It makes the SYD highly versatile. We groaned a little bit when we pulled the SYD’s remote out-of-the-box. It looked poor, indeed – until we actually started using it, and discovered that, while its plasticky construction and shiny surface felt a little strange, it was genuinely brilliant. For one thing, it incorporates everything you need to operate the speaker in a highly intuitive layout: volume buttons dead center (and larger than the others) and the assorted sound controls around them. Input controls were up top, and were a breeze to operate – we particularly like the fact that the Bluetooth pairing button was colored blue, meaning we instantly knew where it was. You get full speaker balance controls, an EQ section, and even track controls. Old school it may be, but it definitely works. Compared to other audio remotes - like the one found on the NAD Electronics D3020 V2, which we tested recently (full review here) - it does a much better job. The packaging is largely forgettable: a simple cardboard box that houses the speaker, the power cable, the remote, and a 3.5mm Aux cable. The other cool accessory you get here is a speaker stand. That sounds like a weird thing to be geeking out over, but it really does help with the look and feel of the speaker. It’s a slim, robust metal stand that you place underneath the horizontal part of the speaker, giving it an angled lift. Kanto said this helped with the soundstage, but we didn’t detect a significant difference when it was removed. What it does unquestionably help with is the look and feel. We really like the slight angle, even if the underside of the speaker quickly becomes a gathering place for dust. By the way: you don’t get a speaker grille here. We are very much in favor of this, as we think grilles are for losers, but it may be a problem if you want to hide your speaker. You monster. The Kanto SYD delivers excellent, punchy sound quality that really satisfies. The design is subtle, but works really well, and isn’t nearly as dull as its housing would suggest. The remote, setup and ease-of-use for the SYD are excellent. The SYD’s high-end could use a tiny bit more detail sometimes. Volume changes for the speaker felt a little imprecise. It lacks Wi-Fi and it isn’t a smart speaker, which may be an issue for some. The SYD’s biggest competitor is unquestionably SONOS, and arguably their mid-range PLAY:3. It’s a slightly different beast to the SYD. Firstly, it’s cheaper, at $249 to the SYD’s $330. Secondly, it uses Wi-Fi over Bluetooth, and relies on an app for its setup. Thirdly, it doesn’t sound quite as good – the multiple drivers and the tuning on the SYD are more than a match for it. Although, the high end on the PLAY:3 is probably a little bit better. Honestly? You’ll be happy with both. Buy the SONOS if you want something more advanced, but buy the SYD if all you want is a straightforward Bluetooth speaker that can do some heavy lifting. One speaker that we recently crossed paths with is the SOLIS SO-7000. We’d say that in most areas, the SYD has it beaten. While it arguably delivers a little bit more volume, the sound quality isn’t nearly as good, and it isn’t as fun to use or as well-designed. Our reviewer also had issues with the Bluetooth, with constantly dropped connections: “We had such a hard time staying connected to this speaker that it was actually a struggle to use in day-to-day life.” Given how well the SYD performs, we’d say the choice is clear – although in fairness, the S0-7000 is cheaper, at $250 the SYD’s $330. One thing that the SYD isn’t is portable. That’s not a huge problem – it certainly doesn’t advertise itself as such – but given how many Bluetooth speakers do double duty as both home and away models, you may want something a little easier to carry. If that’s the case, try the Bose Soundlink Revolve+. While it is more expensive than the SYD, at $299, it offers a decent battery life (sixteen hours) and a solid sound. It doesn’t quite have the punch or energy of the Kanto, but it’s a very good speaker nonetheless. The SYD’s design isn’t completely new – it used to exist as the SYD 5, and had a dock for a phone. Kanto have been around for a few years now, and they’ve got several other wireless speakers in their ranks. 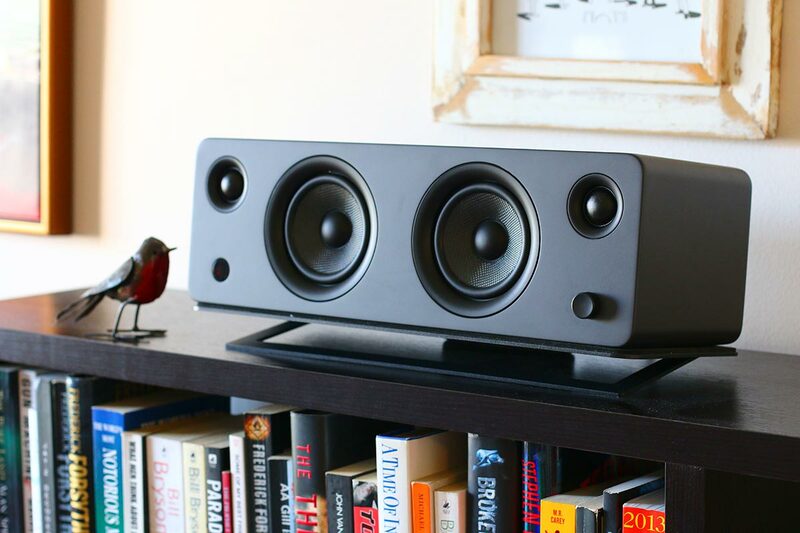 If you want something a little bit different, try the twin YU6 speakers. They are a little old now, but they arguably give even better stereo spread than the new SYD, and with similar sound quality. The remote is identical, too.